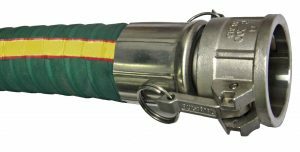 Type 2909C XLPE Chemical Hose is a premium grade chemical resistant hose designed for transfer of a variety of liquid chemical & acid solutions. A slick, clear, modified (cross linked) polyethylene tube will not contaminate the conveyed product. The corrugated EPDM rubber cover offers higher flexibility than traditional smooth-cover chemical hose, along with weather resistant properties. A dual wire helical reinforcement offers durability, full vacuum capability, and kink resistance. XLPE chemical hose is also available in blue cover. While the tube is non-marking, the hose does not carry an FDA rating, do not use with food, beverage, or pharmaceuticals.